What do you do with a bunch of bell peppers?? You stuff ’em! 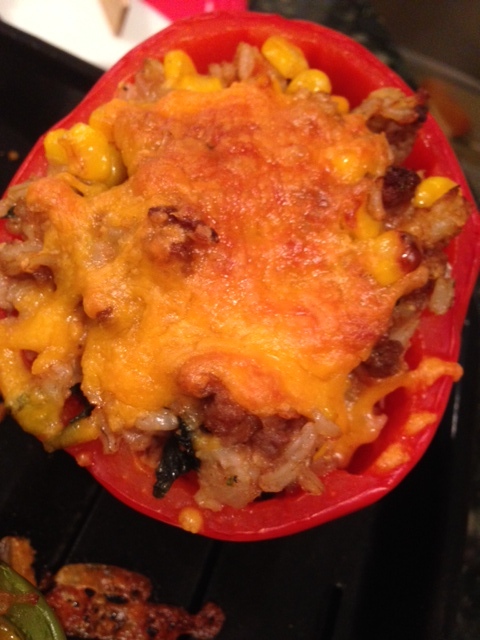 You can really put whatever you want in a stuffed pepper recipe–vegetarian, vegan, ground beef, etc. I had some leftover veggies in my fridge that weren’t necessarily enough to serve as a side dish so I mixed them, cooked them up, and then stuffed it into the bell peppers, and baked! So easy, guys. You can even prepare these a day ahead of time, keep them in the fridge covered, and then warm them up when needed. This makes for a great weeknight meal and also a great lunch to bring to work the next day! **Keep in mind that I just used what I had lying around in my fridge! Feel free to tweak your recipe based on what you have available, there are no rules! Boil a large pot of water and cook the empty bell peppers for 3-5 minutes or until slightly tender. Drain and set aside. This will drastically cut down on your baking time!! Preheat your oven or toaster oven to 350 degrees. In a large pan, heat some extra virgin olive oil and sweat onion for a few minutes. Add garlic and ground beef. Brown ground beef. Add the corn, wine, tomato sauce, and kale. Stir to combine and lower heat to simmer. Season with salt, pepper, and the Complete Seasoning. Allow it to cook until the wine and most of the tomato sauce has cooked down and evaporated. Add the brown rice. Once your filling is at the consistency you prefer (I like mine pretty dry) you can fill the peppers and top with cheese! Place your peppers in the oven for approximately 15 minutes or until pepper is easily pierced with a fork and soft. Serve immediately so you get all that cheesy goodness!! ← Burger Beast’s Frita Showdown! à pied pour maigrir d’une manière optimale. (FSA) as a pre-tax way to enjoy additional savings on their procedure. can certainly do to truly assist individuals by recommending products from brands you worry about.